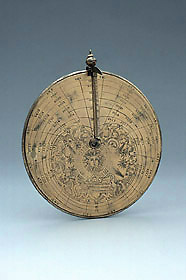 This unusual vertical dial consists of a plate with a raised edge, similar to an astrolabe mater, into which fit two other plates. At the centre is an unidentified coat-of-arms in which the charges on the escutcheon have been effaced. One of the plates bears the inscription 'Curriculum meum perficiam donec aduenerit dominus' ('My run will be complete when the Lord will have come'). The type of engraving on the instrument, partly carved, partly in relief, is unusual.